This is a miniature urn and is intended to hold only a small portion of cremains. Its maximum volume is 45 cubic inches. 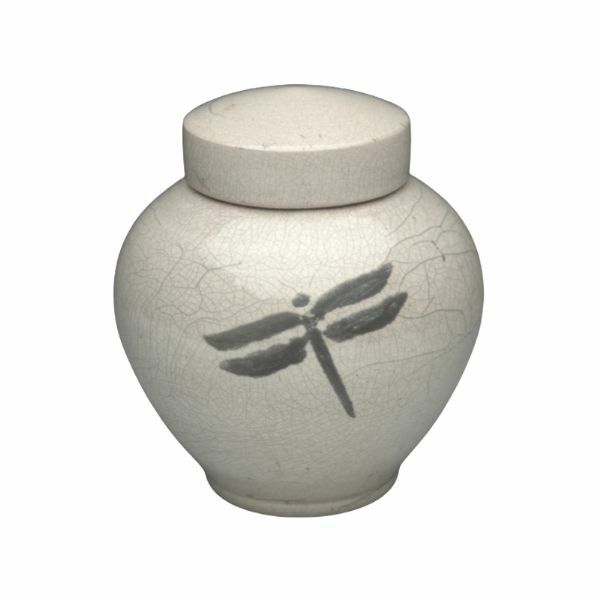 The Dragonfly Raku ceramic keepsake cremation urn is crafted in the shape of a contemporary style vase with a top-opening lid. If is finished with a White Crackle glaze and a Dragonfly silhouette. 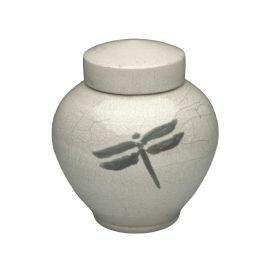 Since each Dragonfly Raku urn is special and one-of-a-kind, please allow for slight variations in color, texture, and size. In Raku firing, a traditional and ancient Japanese firing process, each piece of pottery is taken from the kiln red hot, the molten glaze silken and glowing. It is then placed in a bed of straw or leaves in an air-tight container. The dry plant material immediately bursts into flame and the “reduction chamber” is sealed. The flame and the smoking, oxygen starved atmosphere transform the glaze surface creating the unique, seemingly ancient, colors and textures of Raku.